The glass piece measures 3.7cm X 2.5cm at the widest part. 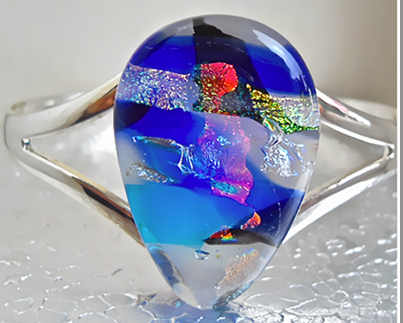 It's made of many different coloured pieces of Dichroic glass on a Clear base finished off with a layer of clear glass. The bangle is good quality silver plated and is adjustable so will fit most wrists. It comes in a silver card gift box.